This breaker was from an 80’s model single wide trailer. It had a window air conditioner and a small modular clothes drier on the circuit. Not good. What rating was this breaker? Any idea of the actual combined load of the two appliances concerned? The load calculations worked. 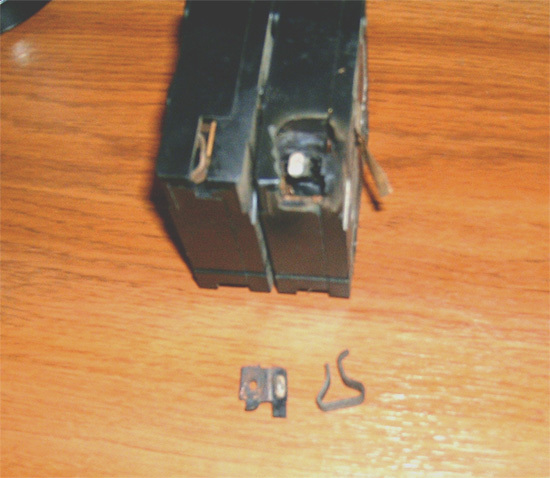 This was a 2 pole 50A circuit breaker. The air conditioner pulled twenty and the the drier pulled thirteen. The drier is the little cube driers that could barely hold four towls. The trailer itself was not very big and had accomodations more akin to a travel trailer than a blocked up mobile home. This was in its own enclosure (rust covered)and the owner could not afford to buy a new disconnect. I would have bought him one if I could have afforded it myself. He had lived there for ten years and had never cycled the breaker until it started tripping out. Luckily it only cost twelve dollars to replace it. I am probably going to go back and help him out with all the safety issues I saw there when I get finished with my current sub contract that I am doing after work and on the weekends. I gave him a list of the safety problems and some precautions to take to keep his family safe until I can hook him up. Was the panel sideways so you could use it as a hot plate too. Nah, that thing looks like it was cooking for a while. Funny what a little loss of spring tension, some dirt in the connection and heat will do over time. Anyone got any stats on how often this happens? I'll take a stab at <1%. Not bad for what could be millions out there with no problems on totally hidden slapper connections. Fact that it didn't trip at all or after the first few times probhabley doesn't say much.